Three basic areas that a palm reader will look for while analyzing your hands during your palmistry reading are lines, mounts, and shapes. Of the four major lines, the first three (heart, head, and life) should be relatively easy for you to locate on your hands. The fourth major palm line is the fate line, which is sometimes broken, faded, or even missing altogether. Don't worry if you struggle to locate your fate line or any other important lines. 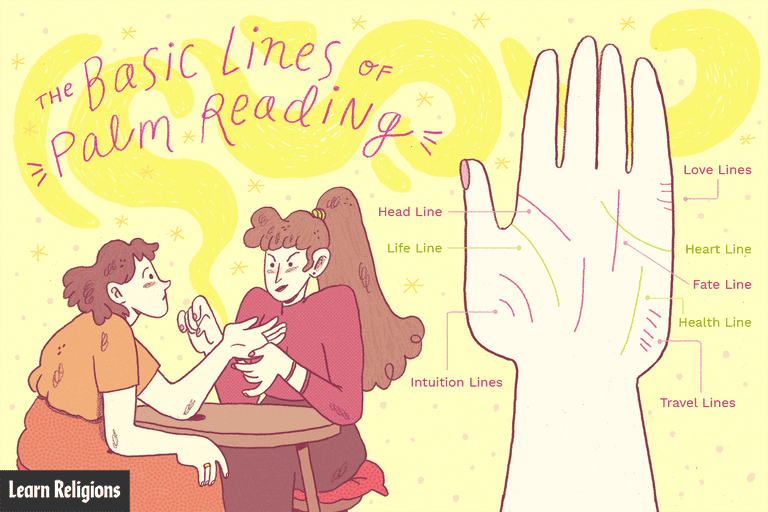 For palmistry practitioners, missing or fragmented lines simply provide more insight. To get started, explore the major lines and some of the better-known minor lines, comparing your own palm to the images provided. Placement: Upper Palm Heart Line. Placement: Middle of the Palm Head Line. Placement: Mid to Lower Palm. The life line begins somewhere between your thumb and index finger and runs down toward the wrist. The life line is generally curved. Forked Line: Various meanings depending on fork placement on the hand. Generally, forks indicate diversion or life change. Although they can also mean scattered or split energies. Double Line: Partner with soulmate, or another person nearby (i.e. family member or friend) who serves as a guardian or caregiver. Placement: At the center of palm, a vertical or slanted line dividing the palm in half. The fate line is often depicted as a straight line that splits the palm into two sections, but it is not uncommon to have an arched or curved fate line. This line may look more like a garden path than a direct highway. Neither is better. A straight line can indicate a focused life plan, whereas a twisted or wavering fate line could indicate the path of someone who spends time exploring or searching for the best fitting path to undertake. Not as easily define as the three dominant palm lines (heart line, head line, and life line), your fate line will give indications of the challenges you may experience as you pursue your life's purpose. The fame line gives light to a person's fate or destiny, indicating brilliance or artistic ability that enhances life purpose. Note: This line is not always present. Also called "Palmistry Marriage Lines" Love Lines. How many love lines do you have on your hand? Multiple love lines indicate the number of significant relationships you have had (or will have) in your lifetime. Sometimes it is easier to see these lines if you bend your pinky slightly toward your palm to see the line creases. Note the appearance of the individual lines. For example, a troubled relationship will often be reflected as a fragmented, jagged, or wavering line. A love line that is forked could indicate a parting of the ways through divorce or separation. A deeper groove is usually a solid sign of a strong-lasting bond. Smaller or faint lines branching off a love line are the offsprings born out of a relationship. These children lines are not as easy to see because they are smaller and often faint lines branching off the love line. The spacing between two love lines can also tell a story. Spaces may indicate the span of time that lapses between relationships. A wider gap could indicate several years, while a narrow space could indicate less time between loves. For example: Let's say that a young couple marries, but their partnership ends in divorce within two years. The man remarries within a few months, but the woman remains single for eight years before she gets involved in another relationship. If you were to look at their individual palms it is likely you would find two love lines butting up to one another on the man's hand, but the woman will likely have a 1/8 to 1/4 inch space between two love lines on her hand. Your love lines map significant heart-connections or karmic relationships. Keep in mind that palmistry does not distinguish between a legal marriage, a common law marriage, or a love affair. Marriages of convenience will likely not get mapped onto the palm at all. In other words, a loveless marriage or less-than-significant partnership will not show up as a love line on the hand. Placement: Vertical lines beneath pinky finger Children Lines. Children lines commonly root out of marriage lines or love lines indicating births that are a result of corresponding relationships. Lines in the palm that indicate the children in your life are any vertical lines underneath the pinky finger or between both pinky and ring finger. Children lines can be isolated or rooting upwards (or downwards) from a love line. The children that are indicated on your palm are not necessarily born of you, they can also be adopted, or foster children. Any child that you have a special bond with will be marked on your palmistry life map. These children are not necessarily your biological offspring but could be grandchildren, nieces or nephews, an adopted child, or even a neighbor's child for whom you've taken on a maternal role. Children lost to miscarriage or stillbirth can also be reflected on the hand. These lines will look shorter, fainter, or broken. Live children's lines can also appear broken if the child is challenged with a health issue. Imagine a vertical children line as an upright person. The head of the child would be at the top, the feet at the bottom. So, if you see a break or diversion in a vertical line look at the placement for health indications. Is the mark at the head, neck, chest, stomach, leg, or, knee? This would be the location where a child might have a health concern. Placement: Parallel to Life Line (either side) Intuition Line. The more prominent this line appears (deeper, longer) the stronger the indication that psychic ability is a dominant characteristic for the person. Intuition lines are not the easiest to detect​ and may be absent entirely. Placement: Vertical line begins below ring finger Health Line. The degree of health challenges during your lifetime is indicated by the strength or weakness of this line. An absent health line usually indicates that health is not an issue. It is most common to have two or three bracelets. Although, some people have only one bracelet, and having four or more is possible. More bracelets indicate a longer life, broken bracelets indicate ill health or lowering of chi energies. Placement: Mid to Lower Palm Underneath Pinky Finger Travel Lines. Travel lines may indicate travel or simply a desire to travel. Placement: Semi-circle between index and pinky fingers.